Inspiring Communities is the reference point for community led development (CLD) in New Zealand. Our vision is that all communities flourish. We use our team’s CLD expertise and experience to mentor, connect, train and support people, organisations and communities to make their places even better to live, work, play and invest in. For the last decade we have been learning with and from Kiwi communities about what CLD is, what good practice requires, and sharing tips, tools and frameworks that assist locally-led action to thrive. Why a CLD Capability Framework? CLD requires new ways of thinking and collaborative working. Having the right mix of capabilities within community-led initiatives is key. 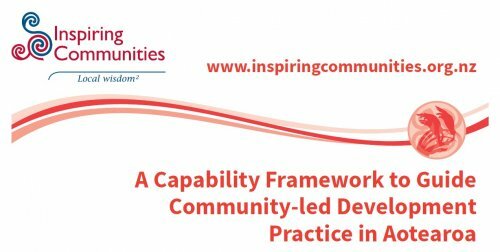 Inspiring Communities (IC) has developed a capability framework to help name values, qualities, skills, knowledge, behaviours and attitudes that are useful to have, learn or amplify to support sustainable change in communities. How we work in CLD is really important, not just what we do or achieve. No-one is likely to have or need all the capabilities on this framework. Why have we named capabilities for different roles in CLD?